Long live the King! But he didn’t. Henry V took the crown on April 9 of 1413, and by August 31 1422 he was dead of dysentery. Which isn’t even really the bad news. The bad news is that this second monarch from the House of Lancaster wasn’t actually a good king. I know, I know, “We happy few, we band of brothers”. He could sure give a speech before a battle… if Shakespeare wrote the words. And Agincourt was a thumping English victory over the French and who doesn’t love that? Except perhaps Jean Chrétien, I guess. But for what? Henry became king fairly late in the Hundred Years’ War, which had been raging ever since 1337 because the Norman kings of England claimed they were also the kings of France. Which they weren’t, and a good thing too. Their claim was spurious in a technical sense. It arose because Edward III of England was the grandson of Philip IV and grand-nephew of Philip’s brother Charles IV, between them the last two monarchs of the senior line of the House of Capet. When Charles IV (incidentally known as “Charles the Fair” for his hair colour not his personality) died without male heirs in 1328, Philip’s daughter Isabella was unable to claim the crown because under the “Salic law” in force in France, formally asserted in 1316, women could not claim the throne, other senior feudal posts and much else besides. But Isabella figured she could pass on to her son a claim she could not make, and declared Edward king of France. Got all that? Well, for a bit the English accepted the succession of Charles IV’s cousin Philip as the Valois king, Philip VI. But when Philip started messing around with Edward III’s war with Scotland, Edward suddenly realized he was king of France no matter who got killed in the process. Including, ultimately, Henry V, who died in France of dysentery or some such complaint contracted while campaigning. And while Edward and his successors won a lot of famous victories, including Crecy and Agincourt, none of it did England any real good though it did France much harm. So here’s the non-spurious sense in which the English kings’ claim to France was spurious. It just didn’t make sense. France and England were not a natural unit. Nobody thought they were; nobody went around saying “I’m Anglo-French” except a few warlike nobles. It diverted the kings of England from the business of governing England. And if they had conquered France, and with it the capacity of French kings to tax without consent, it would have overthrown the English system unless the English had booted them out. Indeed, the need to fight the Hundred Years’ War helped establish the French monarchy’s independence from representative institutions which was very bad for France in the long run without being any use to England at all. Losing all their French territory except Calais just in time for the Age of Exploration was a boon to England, but the opposite of what its kings sought for a bloody century. 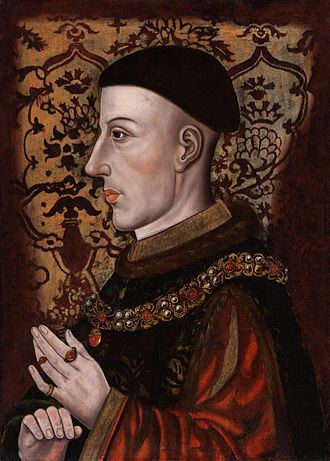 As for Henry V, he spent much of his reign fighting in France, winning hollow victories that did not prevent the ultimate English defeat in 1453. His success in forcing Charles VI to give him his daughter Catherine of Valois in marriage, and proclaim him his heir and regent of France, did nothing except prolong the paper claim of kings of England to the French throne, which was maintained until 1801, by which point there was no French throne for them not to occupy. And Henry’s early death, leaving an infant Henry VI as king, a role into which he never grew, precipitating the disastrous Wars of the Roses that ended with the scary Tudors in charge, followed by the alarming Stuarts. Henry would have been much better advised to stay home and mind his own business. I have high praise of the constitution of England. And it was a monarchy. So it was usually a good monarchy. But that’s not because it had enlightened kings. Quite the reverse; it’s because it strapped them down so it didn’t matter if they were bad and, when it mattered anyway, they got rid of them. Henry V wasn’t quite that bad. But for all my admiration for Shakespeare’s prose and the spirit of that great speech, his reign was misspent trying to conquer France while trouble brewed in England. His early death rather served him right. But even it served his country poorly.